Motivated sellers! Charming 3 bedroom/2bath home with great curb appeal. Bricked and wood sided front entry and sunny south facing decks. This will be the âgo toâ home for coastal get-togethers, with a spacious and easy flow living space focused on expansive view windows and deck access. Second level kitchen, dining and living room are one large space with huge kitchen island meant to accommodate a crowd. When the weather turns chilly the gas burning fireplace surrounded by a wall of traditional brick and oak mantle cozy up the interior while 4 appropriately placed skylights keep all bright and cherry. First level bedrooms provide guest privacy from main living space and master. Spacious 2 car garage with ample built-in storage, easy care yard and off-street parking is the icing on the cake. 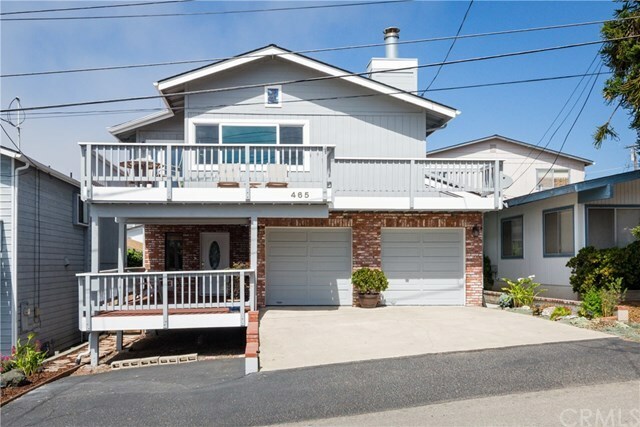 Ideally located far enough up the hill to capture Morro Rock, white water and hillside views but low enough for an easy walk to the Yerba Buena crosswalk and beach access. Come and see all this quality built, impeccably maintained and easy-care home has to offer. Directions: From Hwy 1 take San Jacinto or Yerba Buena east to Main Street, to Rennell.